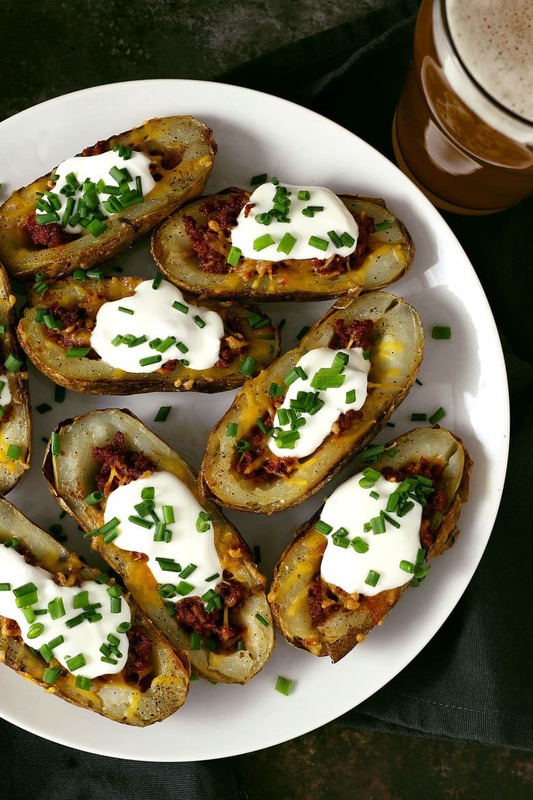 These chorizo and cheddar potato skins are perfect for all of your parties! 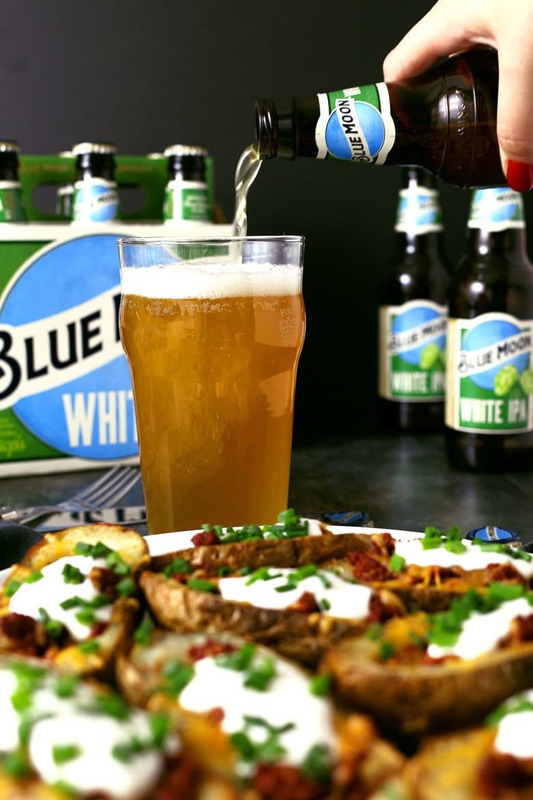 For the perfect food and beer pairing, serve with a White IPA. If you’re looking for game day recipes, this is the perfect one! I’ve partnered with Pints and Plates to bring you this post. Who’s getting ready for the holidays? Everyone, I bet. I’m included in that list and I’ve started to plan all of my holiday menus. I’m going appetizer-heavy this year. By serving an app-heavy menu, I can serve a bunch of different recipes so there’s something for everyone. 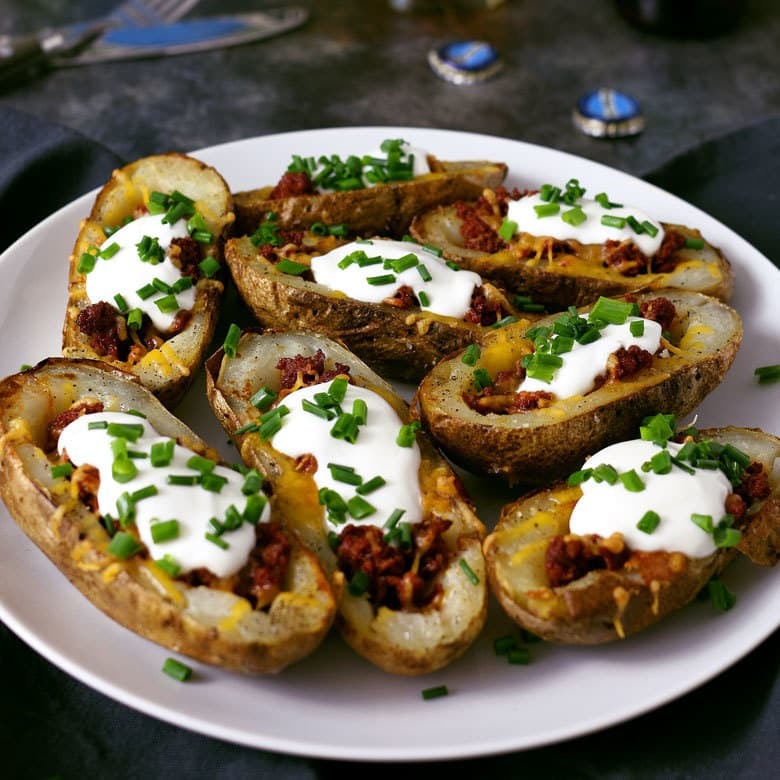 These chorizo and cheddar potato skins are a great addition to my usual go-to recipes. 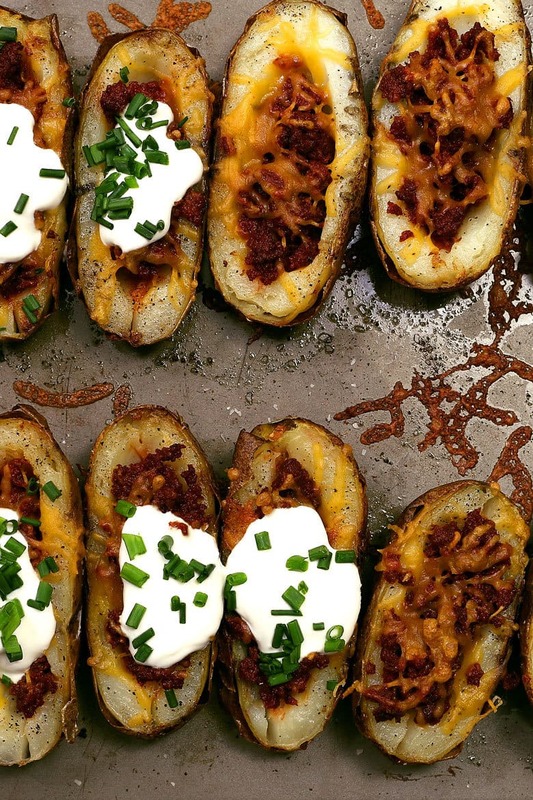 These potato skins are made special by the highly-seasoned Mexican-style chorizo. It lends a meaty-richness to this traditional appetizer. Once I have my food menu set, I move on to the drinks. Many of my family and friends are beer lovers so I’ve been researching beer and food pairings. I no longer go to store and buy whatever beer is on sale; I am really thinking about how my food and the beer I choose go together. Much like with wine, the beer you serve can really bring out the different flavors and spices in your food. Pints and Plates has been extremely helpful in guiding me towards the right beer pairings. 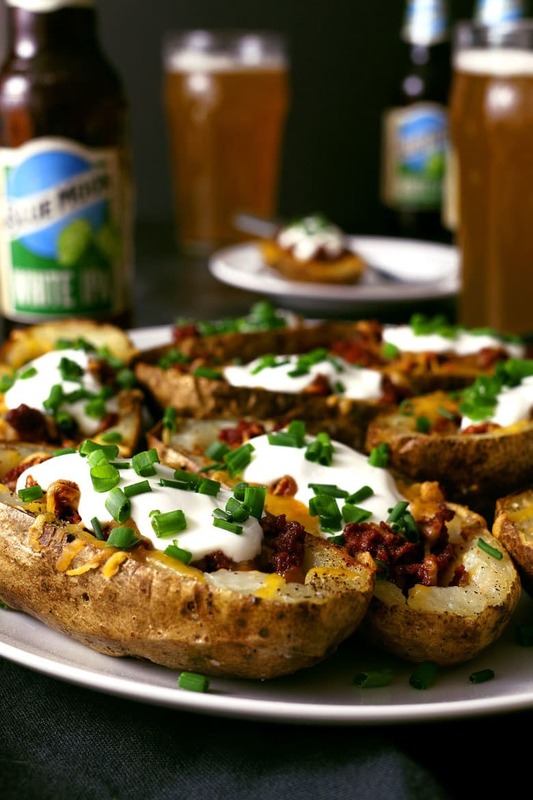 For example, these chorizo and cheddar potato skins go very well with a White IPA. The aromatic hops mesh well with the chorizo’s spices and chives. The bitterness also cuts through the creamy richness of the cheese and sour cream. I went with the Blue Moon White IPA – I love how it combines the citrusy taste of an original Blue Moon with the smoothness of a Belgian white Wheat ale AND hops. I have definitely noticed the difference – my family has been raving about all of my beer choices since I started using Pints and Plates to help me out. Making fried foods? Think about buying an American Lager. Serving some steak at your holiday party? Serve it with a Porter. 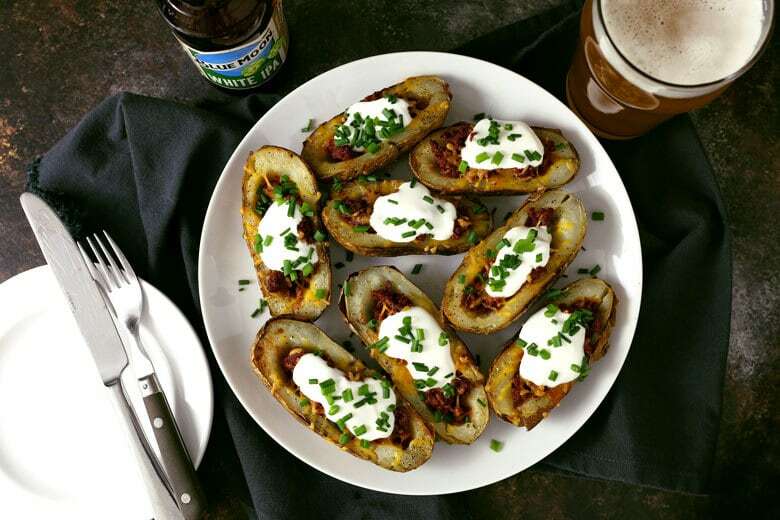 Get the recipe for these Chorizo and Cheddar Potato Skins at Pints and Plates! Disclosure: This post has been sponsored by Pints and Plates. All opinions are my own.